Description: this Raptor figure can only stand up straight in an overly dramatic posture, its body straight upwards, its legs wide apart and its ferocious claws ready for action, its head facing upwards and turned to the right, jaws wide open (incapable of being closed). The tail is bent in a sort of 'S' shaped fashion. This sculpt has proto-feathers on the back of its head, following the design change of the Jurassic Park III Velociraptors as compared to the Raptors seen in the first two movies. Accordingly, it also has a nasal ridge on each side of its face. A dino damage wound is located on the upper base of the tail, revealing some of its tail bones and dark red muscle tissue. Inside the wound a button is found: when pressed this produces a snarling sound. On its back this creature has a small lever, activating the slashing claw action feature. This also produces an eerie shrieking noise. This Raptor has a fairly restrained paint job compared to some of the more bizarrely coloured dinosaur figures of this toy line. The underside (throat, belly, lower part of the tail, feet and arms, inner part of the legs) and most of the head is painted very light grey. The rest of the body (back of the head and neck, back, flanks, the rest of the limbs and tail) is coloured brown. On each side of the body, a brown stripe runs from the arms almost to the end of the tail, interrupted only by the upper legs. A very thin light blue stripe runs all the way above it. The proto-feathers on the back of the head are coloured in the same shade of blue. The face is adorned with dark brown stripes, three on each jaw (so twelve in total, or six if the jaws could be closed), one starting much broader than the others at the eye sockets. The Raptor has small yellow eyes with black pupils, white teeth, a pink tongue and inside of the mouth, dark grey claws on both toes and fingers and a white JP logo on each upper leg. 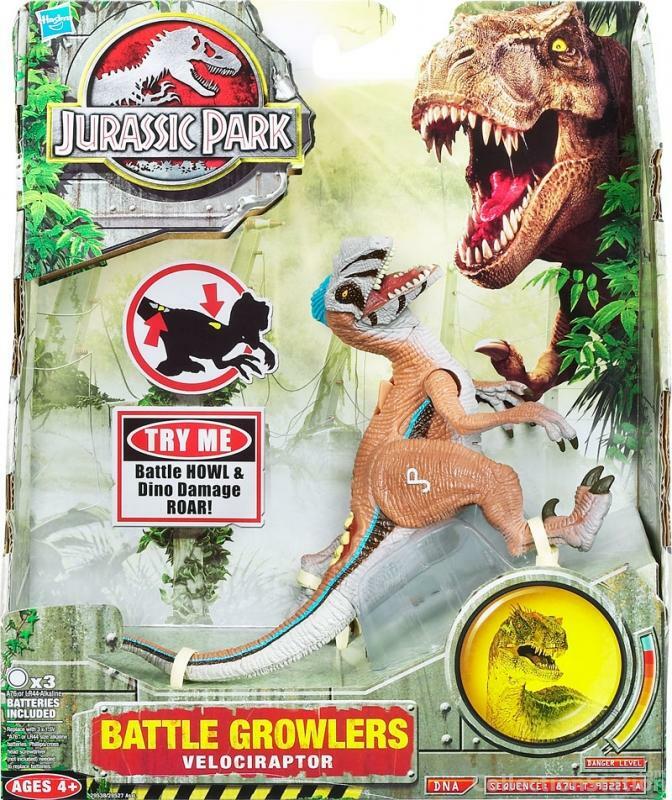 Analysis: naturally this new 2009 JP line couldn't go without a larger Raptor figure, so once again the original JP III Alpha Velociraptor sculpt was revamped (despite the JP III Pack Raptor being such a lousy figure you'd wish Hasbro would repaint that particular sculpt for a change). Apparently the designer who came up with this new paint job wasn't completely high as the designer who thought of the more grotesque paint jobs of this line was (or he/she did a better job at hiding it), since this Velociraptor's paint job is fairly simple compared to those. It's a pretty good new paint job, original enough but also not totally new. It's interesting to see the underside's colour also covering the head for a change, since that is usually reserved for the topside's main colouring. The slight camouflage effect achieved by the dark stripes over the light facial colour works well: it is somewhat reminiscent of a zebra or a white tiger. The brown and blue stripes are also a nice touch, adding enough diversity to the paint job without the overall colouration going over the top. Still, the proto-feathers could have used more work, they're rather bland now. This paint job's colouration remind one of the old JPS2 Gallimimus' colours, with its combination of brown, blue stripes and a light grey underside. This is most likely unintentional though. Otherwise, this release is nothing special. It still comes with an irritating posture hindering playability, a very annoying wound that can't be covered up and a fairly ineffective attack option. It's definitely the paint job that makes this Raptor worthwhile enough. Repaint: yes. This is a repaint of the JP III Alpha Velociraptor figure (Wave 1). It has been repainted several times before for Camo-Xtreme, JPD2 and JPD3. Overall rating: 6/10. A solid new paint job, but only a half decent sculpt. This dinosaur figure is not at all rare and can still be found easily. Since this set was a Toys'R'Us exclusive that could change over time, but probably not in the coming decade.